Welcome to the Verify NWSA System of the National Wireless Safety Alliance (NWSA). This database is a comprehensive directory of individuals who have been certified by NWSA. NWSA strives to ensure the information contained on this website reflects the most current data available, and it may be relied upon generally to reflect an individual's certifications status accurately. 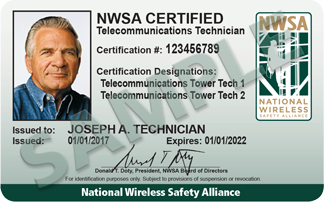 However, please note that screen shots or printed content from this website do not replace an NWSA-issued certification card and should not be used or relied upon by anyone as formal evidence of any individual's certification status. If you require further clarification or have any questions concerning an individual's indicated certification status, please contact NWSA at 703-459-9211 or NWSA@nws-a.org.